Amazon EC2 X1e instances are a part of the Amazon EC2 Memory Optimized instance family, designed for running high-performance databases, in-memory workloads such as SAP HANA, and other memory intensive enterprise applications in the AWS Cloud. X1e instances are powered by four Intel® Xeon® E7 8880 v3 processors offering up to 128 vCPUs and 3,904 GiB of DRAM-based memory. The x1e.32xlarge instance is certified by SAP for workloads such as the next-generation Business Suite S/4HANA, Business Suite on HANA (SoH), Business Warehouse on HANA (BW), and Data Mart Solutions on HANA on the AWS Cloud. 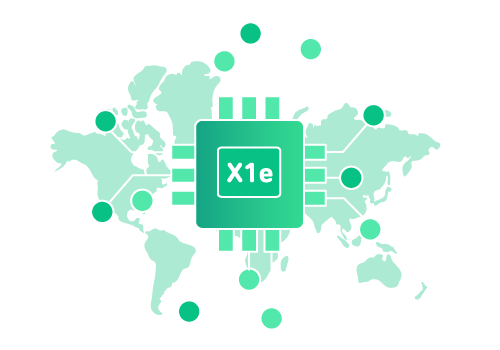 X1e instances offer the highest memory per vCPU among Amazon EC2 instance types and one of the lowest price per GiB of memory. X1e instances are powered by four Intel Xeon E7 8880 v3 processors that feature high memory bandwidth and larger L3 caches to boost the performance of in-memory applications. Applications with NUMA affinity can benefit from the NUMA support across the X1e instance family. X1e instances will offer up to 25 Gbps of peak network bandwidth when enabled with Elastic Network Adapter (ENA) based Enhanced Networking. X1e instances will also enable up to 14 Gbps dedicated throughput to Amazon Elastic Block Store (EBS) and are EBS-optimized by default at no additional cost. The instances also enable increased cryptographic performance via the Intel AES-NI feature and support Intel Transactional Synchronization Extensions (TSX) to boost the performance of in-memory data processing. X1e instances support Single Device Data Correction (SDDC +1), which detects and corrects multi-bit errors.